The Flog It team visit Lancaster, where presenter Paul Martin pops up to the top of the town to tell the story of an amazing local structure. 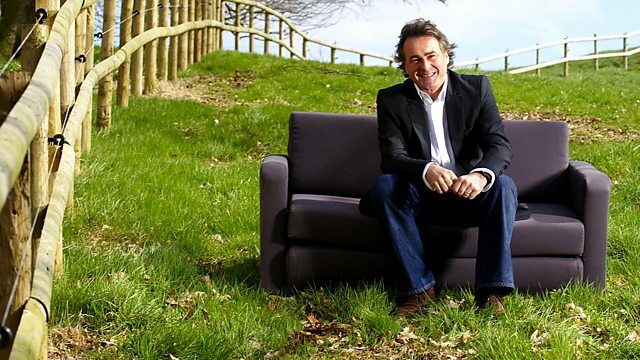 Today's programme is on the northwest coast, welcome to Flog It! for the first time from Lancaster. about the fascinating story behind this incredible structure. which, incidentally, was commissioned by the same man. family heirlooms, are really worth something. Mr Philip Serrell and Anita Manning! What have you two found so far? And as you can see, the hall is filling up. First at the tables Philip Serrell, who's found something rather mysterious. Dorothy, this is interesting, where's it come from? I bought it at a bring-and-buy sale about 30 years ago. So I paid a pound for it. is going to be confined to the bin, isn't it? -That was what I thought. -So it was really bought out of the sympathy vote? Why has it taken you 30 years to decide to sell it? and I really forgot about it most of the time. I've tried to brush it a little, but you can't do a lot with it. ..modern pin. Is that you, Dorothy? Yes, I did, I thought it needed something in the middle. Well, it does a job there, so we'll just leave that as it be. It's a Victorian love token, really. -this particular one has been done by a sailor for his sweetheart. And you can just, can you see these anchors? -So, we've got the anchors and the hearts. -in the literal sense, as a labour of love, as a present for someone. It would date, I would think, to the last half of the 19th century. So it's a Victorian sailor's love token. And I think it's really sweet, it's become quite collectable. Any idea what it's worth? No, no idea at all. that's in there, but I think that's gonna make between £30-£50. If you have a bit of luck it might make a bit more. So you've been to your bring-and-buy, now it's your take it and flog it! -Let's hope it does really well at the auction. Dorothy, this was the best-looking bird in the queue! -What a lovely object, what a wonderful thing. Tell me, where did you get her? and he left it to her, and she left it to us. Now, Edna, tell me, what do you think of her? I think she's really tactile. You want to touch her all the time. Did you think of giving her to your sister? Erm, I love her but not that much! the period that she was made was say between 1910 and 1920.
so that may fit in with the fact that it was given by a Polish gentleman. we can see the artist's signature here. ..to perhaps identify the artist. That will be interesting, mmm. and this stud tells us where it was made and which foundry made it. Now, what I like most about her is the overall beauty. isn't that a romantic idea? she will be very popular, have you had it valued before? The estimate I would put on it would be in the region of £300-£500. Would you be happy, Dorothy, to sell it at that price? we'll put a reserve of £300, with a little bit of discretion. And I'm sure that she will be fiercely competed for. those dogs are flying through the hedgerow, such movement! Tell me all about this. I literally rescued it from a skip. -You've had it 35 years, OK.
And I was working at the Customs House on Lancaster Quay. throwing stuff away which probably was of value. -Yes, do you have one? -No, I might get one one day. And I just thought, it's a real shame to see it thrown away. Exactly, and someone was gonna literally chuck that. So I asked if I could have it and they said, "By all means, take it." -That was a bonus on top of your wages, wasn't it? Yes. I'm hoping it is anyway. -And you've had it on your wall for the last 30-odd years? Can I take it off and have a good look, do you mind? I absolutely love it, I think it's typical of the 1830s, 1840s. Have you done any research on this? Erm, first of all the name came up, Abraham Cooper. Well, he did sporting dogs. And he flourished in the 1830s, he did paint dogs just like this. it's certainly in the style of. -This was painted on card. And it's been laid on plywood, quite a thick piece of plywood. Have you had any work done to this? -you know, from the 1930s. I thought, to me, it's worth it. I just like the picture, full stop. -You fell in love with it. How much did you pay for restoration? -Right, so, the picture owes you £300, basically. I do think it's been over-restored. I think it's been slightly treacled up, and I think it's been cut down. Was it always this size? and there would have been more foreground interest here. "Abraham Cooper", you know, 1840, or something like that. -It would have been nice. -then you would have been looking at £2,500. cos I want you to make as much money as possible. I don't think we're gonna get a sniff. I think we've got to tempt people in. Are you happy with £400-£600? so you're not gonna lose any money. and we'll get that top end. -It's about time it moved on, yeah. -How are you doing, James, all right? -How long have you had this, then? -My father had it in about the 1940s. When I was about five years old. -You've just told everybody how old you are now! I know, it's not a problem. -Did he enjoy a drink? So what would he have kept in here? Three different sorts of malt? -He probably would because he used to have pubs as well. -Why's it called a tantalus? -Cos it tantalises you and you can't get the booze out. than you'd normally expect to find. you can't get the decanters out. out your decanter comes out. -But there's a lot more going on here, isn't there? This is quite interesting. That is for lighting a cigar. You put the end of your cigar in there, and then bang. -that's quite nice in its own right, isn't it? Playing cards would have fitted in here. And quite what would have gone there, I'm unsure. So, it's a tantalus, with a games compendium here as well. You fall between two stalls a little bit really, because this is oak. are much more sought-after than the oak version. perhaps a little bit more. -of about 180. How does that sound to you? And if it makes 200 quid, what are you going to spend that on? Probably give it to my daughter. -She'll soon find a way to get rid of it. -She's a spender, is she? -Handbags?! Oh, my life! So this is going for a handbag. -Let's just hope it sells really well. so let's remind ourselves of what we're taking. Dorothy's canny £1 buy should see a great return at auction. whose decor will suit Dorothy's beautiful statue. And it's amazing what you can find in a skip these days. on the day to buy Cedric's painting. James's oak tantalus should do very well. have our experts got their valuations right? we have two auctioneers today, Kevin Kendall and David Brooks. thinks of Cedric's canine composition? and thank goodness the dogs are in chase, they haven't got to the kill. I'd have said, "No, don't want that, I don't think it's gonna sell!" -..on a building site some 30-odd years ago. recently he had it restored and paid £300 on restoration. they've mounted it on the wrong kind of plywood, it's far too thick. And they've kind have taken the love out of it, for me. so we're gonna try and get him £400-£600 for this. Yeah, I think we could struggle. It's catalogued in the style of Abraham Cooper. but I think we'll struggle to get several hundred. It's pretty typical, naive style, and could be painted by anybody. that sort of linear look. it looks like that, but it is earlier. But it has been cut down from a larger painting. -so with the wind behind it, we could just about get there. that's what we're hoping for with Dorothy's little pin cushion. A nice little love token. I love the anchors and the hearts. You found this, didn't you recently? You'd forgotten you had it. It was in the cupboard, yes. I did buy it quite a while ago. That was a good spot though. -but it's gone up considerably. Hopefully, if we get the top end, a little bit more. -That would be rocking, flying away! -That would be very good. Lot 60, a very nice lot, the Victorian sailor's memento cushion. A very nice lot. Some old romantic would have made this as a gift. And we have interest in it. Romance isn't dead. We start the bidding, with me, at £40. £40 bid. 45. 48. £50 now. 50, bid. £50. Are we all done this time? We sell away this time. -I make that a good profit. You're not bad at this, are you? I should be on the rostrum, shouldn't I? -You ought to be on the telly! Value - £300 to £500. equally as beautiful, aren't you both?! I think this is going to sell well, up here. I know I'm tempting fate, anything can happen. This is what keeps us going. This is where the tension is. We're experiencing it right now. Good luck. It's been a long wait. We've got lots of bidders here though and they're keen to buy. Lot 353 is the alabaster figure bust. The young maiden with the dragonfly dress. 500, surely. 5. We'll start at 250 bid then. 250. 280. 280. 280. 300 on the telephone. 300 bid. 300 bid. 300 bid. 300 bid. That wasn't a bid, was it? 300. 300 is on the telephone. No further interest, we'll sell then at 300. Well, they've gone, that's sold. he'd be prepared to push that bid possibly to the £400 mark. But there was no-one in the room to bid against him. -I'm quite pleased with that. Well, we sold it anyway, didn't we? OK, it's my turn to be the expert now. Remember the dog chase, well, time is up. Hare today, gone tomorrow, let's hope that rings true! That's all I can say. £400 to £600. I've had a chat to Kevin just before the sale started. He thinks it might struggle, but you just don't know with auction rooms. I understand why you want a fixed reserve at 400. -and you spent money on it. -Well, if no go, it's going back home. cos it's an awful moment if things don't sell. But fingers crossed this one will. Here we go. not signed, still a nice painting all the same. Six, four, start lower then, start sensible, £300 bid. 300 bid. 320. 320. 320. 320, now. 320. 40, yes? 340. 340. 350 now. 350, all done? 350. At 350, I'm afraid that's reserved, we can't sell that today. -Oh, well. It's the way it goes, isn't it? Yeah. It's going home. At least you can enjoy it. Yes. Try again some time. -And it's had an airing on telly. -When the dogs are back in fashion! James, this is an absolutely cracking tantalus. Remember the tantalus Philip spotted at the valuation day? It's about to go under the hammer. but it really is a Rolls-Royce version. I think it will be well sought-after. -so it should do very well. -All of the bells and whistles. -Do you enjoy a drink, James? but I don't have a dining room any longer, so it's nowhere to stand now. Some one that does drink in excess is our Phil. Paul, but that was rather hurtful, actually. so you've got smoking, drinking and gambling. The recipe for a good night! We'll start the bidding with me at 150. 150. 160. For somebody with a lot of vices. 180. 190, I'll take. 190. 200. 200. 200. 200. 200, we're going to sell-on commission. 220 at the back. 220. 220 we're selling at this time, at 220. Very, very odd, because that was quality. Could have done more, but it didn't. but we've got £220 on the hammer. I think that's a good result. for thinking we'd travelled to India, but we haven't. We're in Lancaster. And this is the Ashton Memorial. It's known to the locals as the Taj Mahal of the North. this fine Edwardian edifice was built to commemorate a family tragedy. on this highest point above Lancaster City, here in Williamson Park. could have been capable of such a grand romantic gesture? Lord Ashton had originally planned a statue of Queen Victoria on this very spot. he decided instead to have this incredible building built in memory of them all. who's going to tell me a little bit more about Lord Ashton and his touching story. So, Sue, what can you tell me about Lord Ashton? What sort of chap was he? Well, as a businessman, fantastically astute. Made an awful lot of money. By the time he'd died, he'd made £10.5m. -As a private man, we know virtually nothing. He kept very much to himself. he wouldn't have a ceremony to unveil them. -No, they were all unveiled privately. Who designed this extraordinary building behind us? Lord Ashton was very happy to go to London architects and artists to help with his grand designs. After all, he did have a London house. So, he brought in Sir John Belcher, who was president of the Royal Institute of Architects. So do you think it may have been inspired slightly by the Taj Mahal? losses in his family, so there's a personal and maybe a romantic link. Hard to know how romantic he was, but that would be a lovely idea. It's slightly reminiscent of St Paul's Cathedral, with the big domed roof. Indeed, certainly, Belcher was working in that Edwardian, baroque, very confident style. And yes, I think that's quite close to the mark. But it's very dramatic here, overlooking this wonderful landscape. Yes, it's a fantastic piece on the landscape, and everybody sees it from miles away. A great backdrop, isn't it? For Sir John Belcher, it turned out to be the biggest challenge of his career. And the result was much admired by his contemporaries. a grandiose folly with no obvious function. renowned for its cabinet making with exotic hardwoods. You couldn't get any further away from that, could you? Just look at this. and I think that's such a fitting tribute. painstakingly brought up from the West country, hundreds of miles away. And the main steps to the building are all of Derbyshire limestone. was delivered each week by the Ashton Road Yard. In 1907, the total cost of the build was £87,000. Now that's an incredible amount of money. In today's standards that works out as £6.5m. the local community also benefited greatly from his Lordship's wealth. He was a great philanthropist and his legacy can still be seen in the city today. opposite his great memorial, which you can still visit today. Whatever we think of Lord Ashton today, he built beautiful structures just like this one and the memorial. And I tell you what, it really is good for the soul in here. There are butterflies fluttering everywhere. which is a great deal of money. It works out to be round about £30m in today's standards. He gave the city of Lancaster great prosperity, redevelopment and hope. Look at those beautiful little things. where Anita has found something from his era. Cynthia, welcome to Flog It! -This is a lovely wee item. Tell me, where did you get it? I got it from my aunt. It was left to me when she died, quite a good few years ago. It was a present to her from her husband when she first got married. So it was a loving gift at that time. And a loving gift again. But, tell me, have you worn it? Because I don't think it's my style at all. It's probably for somebody a little bit more delicate, I'd say. -Well, that's the thing about jewellery, it's such a personal thing. There are some people who like nice, big, chunky pieces. Other people who like things that are a bit more delicate. And this is a very delicate and bonny wee thing. -so it's a very gentle, delicate sort of thing, and I can imagine a young person wearing that. I think it would be more suitable for a young person than for someone more mature, like me and you! of the Art Deco when you look at this round motif here. But I think it's pretty. Now, price, it's just a very, sort of simple, straightforward type of pendant. and even then, I may be pushing it a wee bit. But if we put 60 to 80 on it. A reserve of 50. Now would you be happy with that? -Yes, I think so, yes. I'll be holding your hand at the auction. -We'll hope that it's really well fancied there. And we'll enjoy the day. Thank you for bringing it along. Sandra, Martin, how are you doing? -I was born in Lancaster, yes. -Oh, right. It's nice round here. and that could be 101 different things in there. it could have a seal in there, and we've got no idea. When we look at it from the top, initially it looks like it's made out of yew wood. but I am absolutely convinced that's boxwood, rather than yew wood. There's only one way we're going to find out what's inside. Let's take the lid off. So this is a compass. Yes? -Yes, I'm sure it's a compass. It's a compass sundial, OK? so that it finds north. And then the sun casts a shadow, and the shadow tells you the time. -But what's interesting is in different times of the year you've got to make adjustments. And here we can see we've got a table for all those adjustments. -These things were popular, I would think, in the first half of the 19th century. I think it's a great little thing. How did you come by it? My grandmother died about 27 years ago and my mother said, "What do you want?" Ornaments, and... I presume Martin said, "I'd like that." -Why would your grandmother have a sundial? Was it just one of those things in a box and no-one knew it was there? -I think she had it in a display cabinet. -She knew what it was. -It wasn't stuffed in a drawer? -And one of you two chose it and you don't know why. I think it's absolutely lovely. Do you think it's worth a lot? I wouldn't like to say. 80 or £90? You're not far off the mark. I think we ought to put a 120-180 estimate on this. It might do a lot better than that. We'll put a reserve on it of £100. I just think it's a nice thing. -Let's hope that time flies at the auction. Angela, thank you for giving me this opportunity to talk to you about this picture. When I saw it earlier on, I was drawn to it. I love this industrial landscape. I hadn't heard of the artist. We did a wee bit of research and I do believe that his work is coming up in auction now. But I would be delighted if you could tell me a bit about him. I knew Trevor when I was a teenager. He went to Stockport Art College before I did. and the reason she thought they were racy was because he didn't wear any socks! I was told, "Don't have anything to do with them. "They'll get you into trouble." I got into trouble without any help at all from Trevor Grimshaw. What he did was he always did Northern scenes and he always did them in pencil. -Is this all the one area? -No, this is different areas. It was Ashton-under-Lyne, Dukinfield, and Hyde, and some in Salford, that he'd worked on. -He brought all these elements together to put into one work? Even the North of England hasn't got that many mills in that much space. I love art and Trevor would say, "I've got this. "Do you want it?" I would say, "Oh, yes, please." My husband never had to do any decorating because the walls were full of pictures. So what we have is this large drawing here and we have two smaller ones. Which I would never part with. The others, yes, but this one I couldn't possibly. -Do you know who it is? -I seem to remember it was T S Eliot. despite all this work, because that one took so long for him to do. It was so precise and it took so long and it was never right. Why do you want to sell these works, Angela? and now I'm moving into an even smaller house and I need a new kitchen. -You want to keep the portrait. I suggest we put the big one in at £400-£600. Would you feel happy at that? As long as it's got a reserve for 400, I'm fine. We could put the two little ones in at 150-250, with a reserve of 150. It doesn't matter at all if they don't sell, I'm quite happy. It's very Northern and this is where we are. You know, it's part of our past that we're never going to see again. -It's part of our history. -Thank you very much once again for bringing them along. so let's remind ourselves what's going under the hammer. Kay's pretty Edwardian pendant should attract plenty of bidders in the saleroom. Let's hope the weather is fair for Sandra and Martin's unusual sundial. her new kitchen with the proceeds of Trevor Grimshaw's painting. Perhaps she'll also be able to run to a pair of socks for him! Cynthia, any regrets? We're right here in the saleroom. There's no turning back. This was your aunt's necklace. -You'd rather have the £60-£80 in cash? Yes, I'm going to buy some jewellery. Are you? Sell some jewellery to buy some jewellery. Someone who would like this... is our Anita. It's the beginning of the 20th century, looking towards Art Nouveau, maybe a wee glance at Art Deco. It's very pretty, very simple, and I hope it does well. Lot 244. Yellow metal pendant set with aquamarine and seed pearl. I've commission interest. I can start the bidding with me at £30. -55 in the room now. 60, fresh bid. 65. With the gentleman now at £65. -I'm selling, make no mistake. -That's not bad, is it? Spot-on. and this is absolutely divine. It's a little sundial. You've got to find north but then you can tell the time. Do you know, if this was mine, I wouldn't be flogging this. -But it's got to go, hasn't it? We're raising funds. What for? -And what's the lucky guy? So is this going to be a new hat or is it going towards the cost? The cost of the wedding, the reception. Philip, this could do a little bit more than your top end. -I have to say that I'd miss a course at the reception and keep this. Good luck. We've both enjoyed looking at this. I'm sure it's going to find a collector here and make lots of money. For the big day. Right now, this is your big day. -Now we have lot 94 which is the 19th century pocket sundial. I'll start the bidding with me at £90 only. £90 bid with me. 90 bid. 100. 100. 110, sir? 110. 110? 110 only this time. At 110. I was expecting 200 quid for that. I would have loved to own and I would have loved to bid on that. You could argue, why didn't I put more money on it? I think you have to put an estimate of 100-200 to sell it. I think it's worth that sort of sum and then you get the competition of the auction room. But I think that was disappointing. It's gone. And it's going towards that big day. Good luck, Martin. There's two of them, Trevor Grimshaw paintings. Monochromatic. You went to art college with the guy. He went a little time before I did. I saw the guy. I knew him very well. -I wondered if you had socks on today. It's a lovely little collection you brought in. I like the portrait. You hung on to that one. That was gorgeous. The larger one, that's a mill-scape, that's really nice. 400-600, and there's two in the next lot. We've got a conservative estimate. We could punch through the roof on these. We could. I've done a little bit of research since the valuation day. This artist is doing well in auction. He had a retrospective exhibition in Stockport Art Gallery in 2004. His works are coming onto the market and they are reaching good prices. The sale will be on the internet so let's hope they pick up that name. Exactly. This will have a worldwide audience. the next name to buy for is always the big catch. Buy at the right time, sell at the right time. -Maybe this is the right investment. Let's hope we get more than £600. -It would make your day, wouldn't it? -Gosh. You've got a lot more at home. 396 is the first of the Trevor Grimshaw lots. Signed and dated. What can I ask for a start on this lot? 500, surely. Four? Start me at 300 bid. £300. £300 on the bid. 320 at the back. 20 on the phone if you can? 420. -460 on the phone. Are we going to sell? Have you all done this time? At 460. Good start. Here's the next one. Lot number 397. Again, Trevor Grimshaw. as the phone and I have to start at £150. 200. 200. I'm going to sell. -Well worked out, very quickly. I always work money out! -You've got to be pleased with that. I am, I'm really pleased with that. There's commission to pay on this, it's 15% here but anything over £500, it's 10%. but I'm pretty sure they might do a favour for you. What will you put the money towards? I could tell you it's going to a kitchen but it's not. I need some new bumpers for my car. -Do you? Have you been parking badly? -I'm not a very good parker. I sort of abandon but somebody reversed into me so I need two new bumpers, front and back. Everyone else is going on holiday and I need two new bumpers! That's it. It's all over for our owners and what can I say? It has been a tough day but our experts did extremely well. We've had some highs and some lows. belonging to Carole selling for a staggering £660. Something worth investing in. Look out for his name. Join us for many more surprises on Flog It! soon. The Flog It team visit Lancaster where experts Anita Manning and Phillip Serrell pore over your family treasures. Meanwhile, presenter Paul Martin pops up to the top of the town to tell the story of an amazing local structure.